The rest of our cloth diapers for Mackenzie should arrive from Cotton Babies later today. 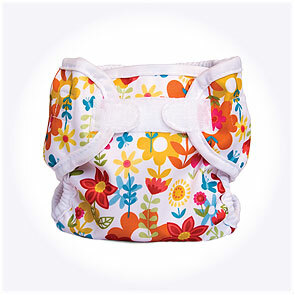 This order has small BumGenius AIOs, newborn Bummis Super Whisper Wraps, and pre-folds. I never thought I’d be excited about diapers, but I honestly can’t wait to see the covers! A big part of my attempt to be both a frugal and green parent will be cloth diapering Mackenzie. Some of my friends look at me like I’m nuts when I say that, but both my mom and Chris’s mom managed to do it with far fewer options than I have available to me today. I know it might be tough at first, but I’m determined to stick it out. Disposable diapers are the third most common consumer product in landfills today. A disposable diaper may take up to 500 years to decompose. One baby in disposable diapers will contribute at least 1 ton of waste to your local landfill. *Based on a report from the Women’s Environmental Network and quoted from CottonBabies.com. Even without the environmental impact, the cost of disposable diapers is enough to motivate me to consider cloth. Based on the advice we’ve received from other parents, we’ve been told to plan on 8-10 diaper changes per day, or about a package of diapers per week. At an average $20 per package of diapers, we’re looking at $80-$100 per month, which rounds out to $1,000 or more per year. Our initial investment in cloth diapers is just $250, plus another $45 for a diaper sprayer (which I’m told makes cleaning them much less icky). We’ll need to add to our stash as Mackenzie grows at a cost of about $150 per year, possibly less. The savings are undeniable. BumGenius All-In-One’s: Six of these are in our order today. These diapers are just like disposables, except that you wash them instead of throwing them away. We’ll have to buy new ones for each stage of growth, but they’re perfect for a few reasons. Namely, making getting used to the diapering process as easy as possible on both of us, and for babysitters/trips out of town. BumGenius One-Size Diapers: I ordered 6 3.0s when they were on sale in June, and I think they are going to work out great. They’re pocket diapers, which means that you stuff the prefold inside the diaper. Chris and I kind of think that you could just lay the insert inside the diaper, and that would work fine, too, but we’ll see how things go. We haven’t just completely made our stash up of these because I’ve read that sizing and absorbency can vary from baby to baby. Bummis Super Whisper Wraps with Pre-folds: I ordered four newborn covers and fourteen pre-folds. I think covers and pre-folds are the most economical route, but you do have to order them by size. We’re going to compare covers with pre-folds to the one-size diapers and see what we like best. If the one-size diapers work best, then we won’t have to order new ones as Mackenzie grows. All of that really depends on her, though. So that’s what we’re starting out with. There are tons of options, but we’re attempting to keep our diapering regimen as simple as possible. If you have any questions or tips to offer, please post them in the comments! a. the BG one-size won’t fit well until she’s around 9-10 lbs, especially if she has skinny legs. but once she hits the 11lb mark, they will be awesome! b. if you’re stuffing the BG 3.0’s with prefolds, then yes, you can just lay the prefold in there. but if you’re using the microfiber inserts, they must go inside the pocket b/c you can’t put microfiber next to a baby’s skin. the only pro about stuffing the pockets is that when she has a poopsplosion ;), it’ll be a little easier to clean up. c. just depending on your washing schedule and how much she goes to the bathroom, you may find that you need a few more prefolds (i have 2 dozen for each stage, but i use exclusively pf’s around the house) but it totally depends on you and her and your schedule. Thanks, Keli! The Bummis covers came yesterday, and I love them! I think you’re right that we’ll need more pre-folds. I think maybe we’ll just stick with the covers and pre-folds through the newborn stage? The AIOs I ordered are size small, and it sounds like it might be a little while until she fits into them.